Show Racism the Red Card have been made aware, that Greater Manchester Police (GMP) have launched a Hate Crime investigation into an incident which is believed to involve football fans who were heading to the match between Manchester City and Tottenham Hotspur on Saturday 21st January 2017. Footage which was later posted online shows supporters singing along to anti-Semitic chants on a Manchester tram which was heading to the Etihad Stadium for the Premier League match. It has been reported that the chants were apparently directed at Spurs supporters. "We know through our partnership work with Manchester City Football Club that they take a zero-tolerance approach to racism and work tirelessly as a club to make the Etihad an open and welcoming stadium to all." "We await the outcome of police investigations and are sure that the vast majority of football fans are disgusted at these events. In the event that criminal charges are brought against individuals and subsequent proven, SRtRC would also anticipate a response from Manchester City condemning the actions as completely in opposition of the clubs stance regarding prejudice and discrimination." "SRtRC accepts that in certain circumstances punitive punishments are inevitable, but would always champion the value of education in helping to change damaging and dangerous attitudes. We will continue to work to educate people and to promote tolerance, understanding and a more inclusive society." 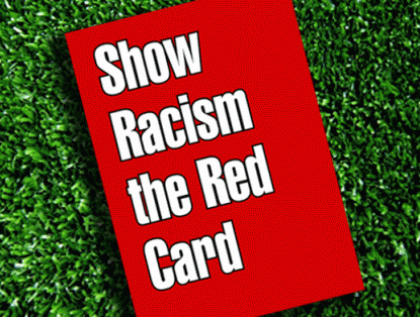 Manchester City FC are long term supporters of the SRtRC campaign; having held anti-racism educational events at both the Etihad and Maine Road. Over the years, first team players from the club have taken part in anti-racism education films where they can use their role model status to engage young people in discussions about the dangers of racism.